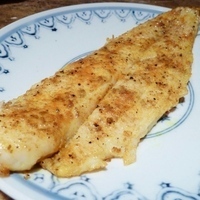 This is a simple dish I throw together with fresh white fish fillets (typically Swai, Tilapia, Catfish, or Orange Roughy). It's easy to make and our whole family loves it. I know it seems crazy to give this four and a half stars, but it's a really great combination of flavors. Try this with rice and a vegetable side dish or salad, and you won't be disappointed! Heat the oil in a large frying or saute pan. Meanwhile liberally sprinkle the paprika and cumin on both sides of the fish fillets, while less liberally sprinkling the turmeric. Then sprinkle both sides with Kosher salt and freshly ground black pepper. When the oil is hot, add the fish to the pan and cover. Cook for 2 minutes on a side, then flip and cover again and cook an additional 2 minutes on the other side. If the fillets are thick, cut in the thick part with a night to check if the fish is white and flaky on the inside. If the fish is still pink or translucent in the thickest part, continue cooking for approximately 2 more minutes, flipping back to the other side for the last minute. Serve over or next to rice with a vegetable. 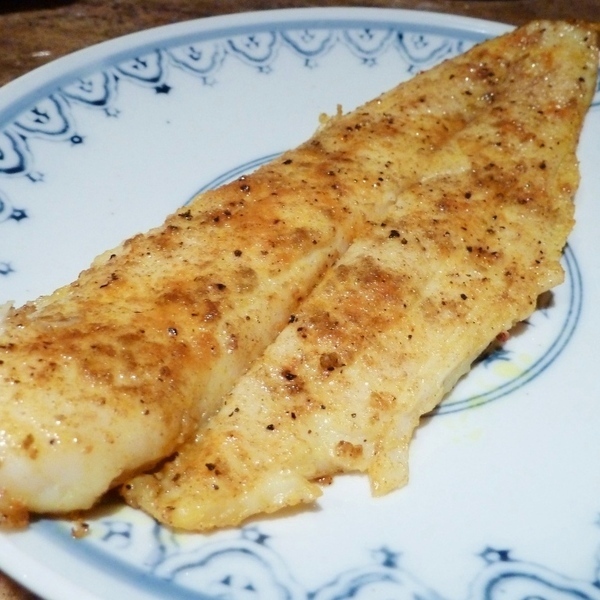 I was a little frustrated when John threw this together last minute with no recipe and our kids raved about how they liked it better than other tilapia recipes I've cooked. That said, I have to agree that this is a really nice mix of spices and makes for a very easy pan fried fish. Hi John, tried this last night with fresh sea bass. Changed the tumeric to curry powder and only used half tablespoon of cumin, but added some red pepper flakes. Served with raisin and cilantro rice...yummy. Thanks for sharing. We made this again tonight, (May/15) with sea bass (that's all we can get here) and changed the flavor. We used a coffee ancho chili powder rub, and cooked the fillets a full 6 minutes, served this with sweet potatoes. The fish was perfectly cooked and the sweet potatoes with some butter and salt and pepper went well together. Sounds delicious, Lillian. I'll try a variation like this in the future. I made this recipe using Swai & it was delicious! Definitely one of my favorites. The fish was awesome! Tender & juicy! Will definitely make this again. ENJOYED VERY MUCH WITH TILAPIA. ITS PROBABLY VERY GOOD WITH CATFISH AS WELL. Did not have turmeric so used a bit of Jamaican curry instead & it turned out good! And I am not the biggest fish fan either, so that's saying a lot! I sprinkled each of the spices (except salt) on 2 Tilapia's coated in Mediterranean Oil (Costco) and baked for 9 minutes at 425 degrees...Served it with steamed brocolli and wild rice. It was excellent. Sounds good, so I am going to try it tonight! I like the implement of the Indian spice combination. I can wait to try this with some couscous and a vegetable tagine!!! Thanks for sharing. Thanks for the comment. I hope you enjoy it! My kid enjoys fish. She loves it. So I try to find different ways to cook them. This is one I could use too. Thanks for sharing.